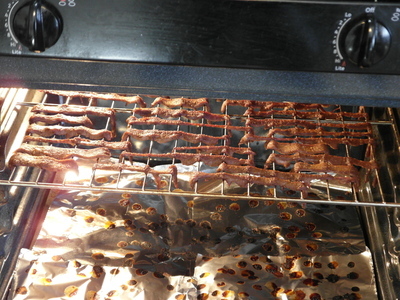 Beef jerky can be made at home without needing any fancy equipment such as a dehydrator. 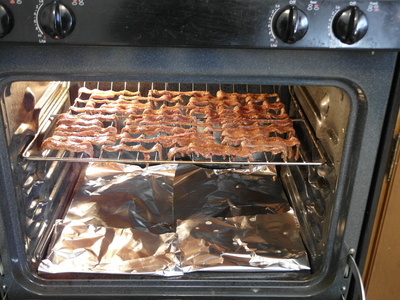 With minimal adjustments a home oven can be used, which can actually dehydrate a greater amount of food at once than most store bought dehydrators. 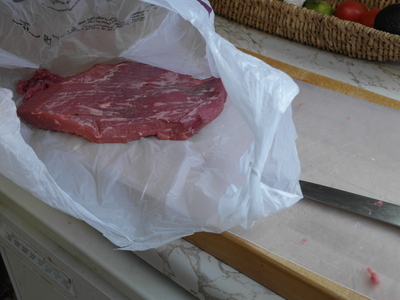 Any meat can be used to make jerky, but it makes sense to purchase an inexpensive cut since you won't need the tenderness of an expensive cut like a filet mignon. Brisket is a good choice. 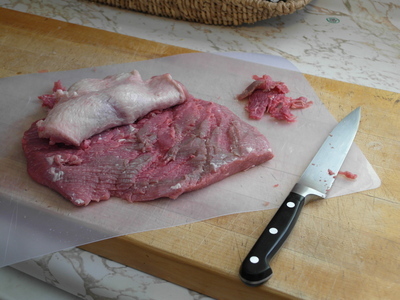 Trim off any fat on the meat. 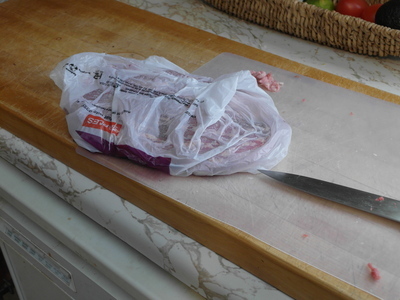 Once I took the beef out of the supermarket package, I found they had deliberately hidden a big sheet of fat on the bottom. Try and avoid this when shopping, but otherwise trim it off. 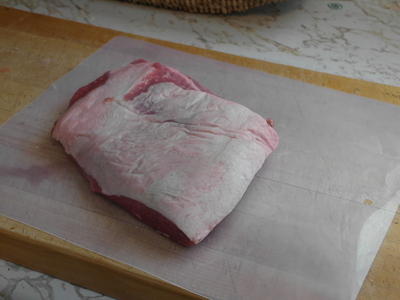 (I have since been educated that the fat is intentional for roasting to retain moistness). 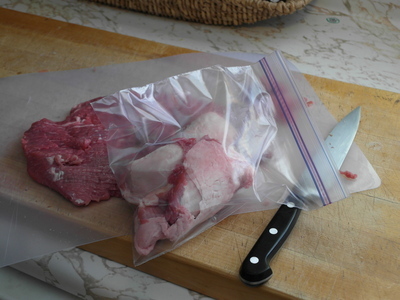 Left over fat can be frozen and when you have several pounds saved up can be thawed, ground, and rendered clean. The rendered fat can be used in cooking, traditional soap making, or other uses. 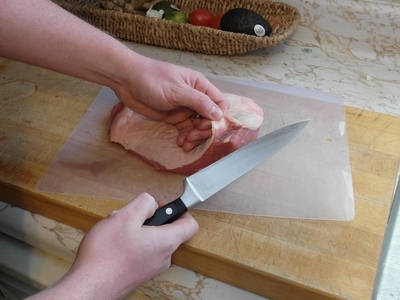 If you aren't in a rush, placing the meat in a freezer for a couple hours will firm it up and make slicing it much easier. 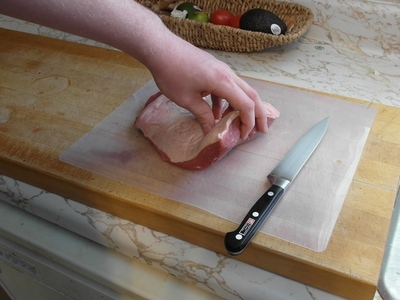 It will cut your slicing time in half and allow you to have more consistent slice widths. This does not affect the end result greatly and is largely a matter of personal preference. 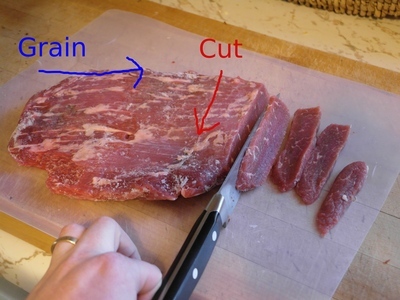 Slice the meat against the grain. 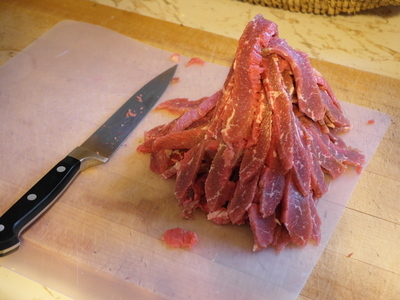 The "grain" of the beef are the layers the meat is in. If you slice with the grain, you will be leaving them fully intact, so when you go to chew the meat your teeth have to do all the work at breaking up the fibers. If you slice against the grain, the knife has done the work and fibers are very small so you don't have as much chewing to do. Slices 1/8th to 1/4 inch thick are appropriate. 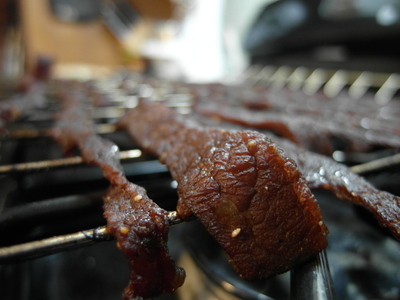 The thinner the strip the less time it will take to dehydrate, and the thicker the strip the "chewier" your jerky might be. 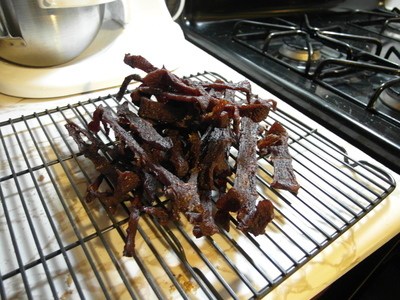 Homemade jerky tastes very different from store bought. It tastes like real meat! If you have a favorite BBQ sauce, use that and dilute it with water at about a 1:2 ratio (Use 2-3 times as much water as sauce). 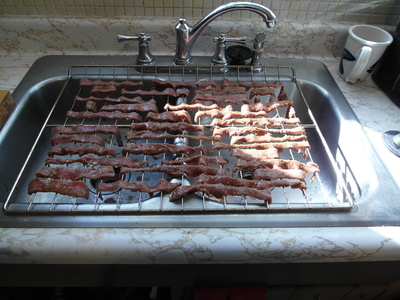 Once the water evaporates off, the flavor will concentrate back onto the jerky. Marinate 1 hour to over night. You may want to add some additional salt depending on your tastes. This step is optional, but only if you prefer scrubbing burned on BBQ sauce from an oven. 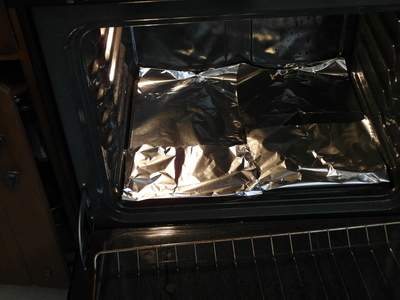 Use the foil. 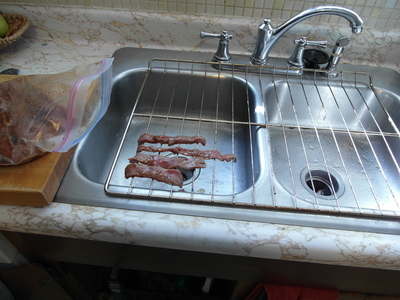 Remove the oven cooking grate and arrange the beef strips on it. 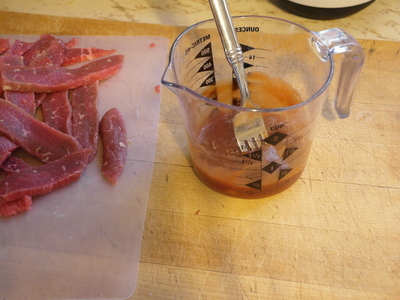 Doing this over a sink is a good idea because the marinade will be dripping off immediately, so less will drip in the oven. 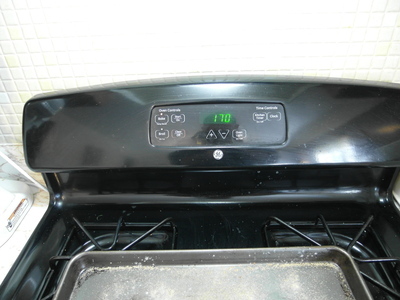 Set the oven temperature as low as it will go. Ideal temperature is 140 degrees farenheight, which will dehydrate the food without cooking it. My oven only goes to 170 (F) degrees but works fine. Using a wooden spoon (no plastic! 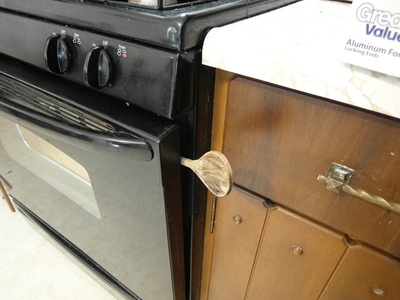 it could melt), prop open the oven door to vent. This lets air circulate and dehydrate the food faster. If you have an oven circulation fan, this could be helpful as well but I have not used one before. 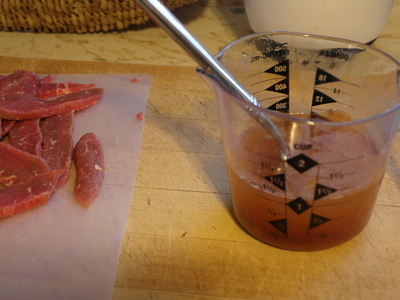 It will take 2-6 hours to make the jerky depending on slice thickness and oven temperature. My batches are around 4 hours long. After about 2-3 hours check for doneness. Take a piece of jerky and bend it. If it bends easily or feels juicy it needs more time. When it starts to stretch or tear the fibers when you bend it it is near done. 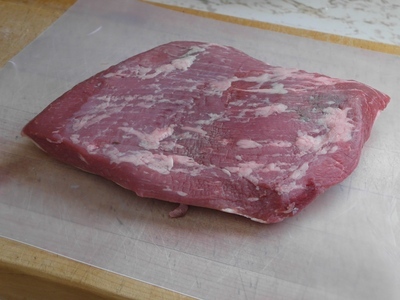 You can let a strip cool out of the oven for 10 minutes and do this test again. 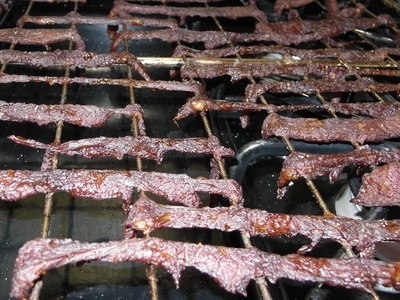 When warm the jerky is easier to bend, so cooling it first can let you know if it is dry like jerky. When I did my first batch, I thought it was done and took it out of the oven. After nibbling on it and testing it out after cooled for 30 minutes I decided it needed more time. No big deal, back into the oven. 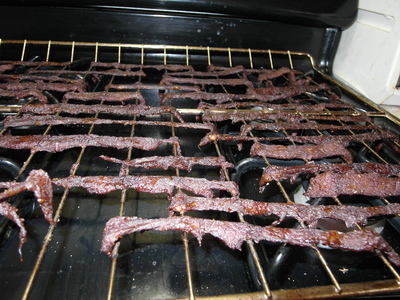 Remove and let the jerky air dry. Don't package it immediately. Give it 24 hours to fully to dehydrate at room temperature, but you can start eating it right away.